This is my next entry in my series of Baseball is Awesome off-season posts. If you've read the introductory post and the first one I wrote on Mike Gardiner you know that this is a series of posts focusing on great Red Sox related moments with some Canadian content. Today's post is on a game that came to be known simply as "The Jeff Stone game". Ok, there were no Canadians involved in this game, and it took place at Fenway. So where's the Canadian connection? First, a brief (or not so) history lesson. Believe it or not, the Yankees were not always our most hated rivals. Until the early 1980s, and since the mid 1990s they have been, but in between that distinction belonged to the Toronto Blue Jays. How did that happen? Let's start in 1984. The Detroit Tigers started off with a 35-5 record and the division race was over before the end of May. But from the date the Red Sox traded for Bill Buckner until the end of the season, Boston had virtually the same record as the Tigers (they were 17.5 out and ended up 18 out), which gave them some optimism for the 1985 season. But after a sub .500 April and May, the Sox needed a strong finish just to end with an even 81-81 record, while the Toronto Blue Jays got to experience their franchise's first ever taste of post-season. I suspect many Red Sox fans were cheering for Toronto down the stretch, as they were in a pennant race with the still hated-Yankees who ended up 2 games short. This would be the last time in about 10 years that we would root for the Blue Jays. See, from then until 1995, the winner of the American League East was always either Boston or Toronto, except once when the Tigers again won it in 1987. In 1988, late in the season we had a comfortable 4.5 game division lead on September 26th, when we went to Toronto for a 3 game Series. After they swept us, getting into the post-season was much more nerve-racking as we held on to beat Detroit by just a single game, while Toronto and Milwaukee were a mere 2 back. In 1989, at the beginning of August, we were neck and neck with the Orioles for the division crown, while Toronto was sub-.500. But a torrid August and September by the Jays, propelled them to the division crown, while we ended up 6 games behind. This brings us to 1990. By now, most Red Sox fans clearly saw the Blue Jays as our biggest threat to get into the postseason. They had won the division in 1985, we took '86, they missed '87 and '88 by only 2 games and were defending division champs. End of history lesson.... With that background on the importance of this rivalry at that time, this post is about a game in 1990 between the Red Sox and the Blue Jays. The 1990 season was back and forth between Boston and Toronto all season. From June onward both teams took turns being in 1st, changing leads 7 times down the stretch. Tied on August 19th, the Red Sox went on a run of 13 out of 15 and looked like they were in command up 6.5. But they then turned around and lost 15 of 21 to find themselves 1.5 games behind the division leading Jays on September 25th. By September 28th, the teams were tied with 6 games to play in the season, and starting a crucial 3 game series at Fenway. It was a Friday evening and I was living in the Toronto area at that time, and some of my roommates went to a local bar to watch the game. I declined the invitation as I knew I would either (a) get mocked if the Sox lost (which is fine really- I have pretty thick skin and can laugh at myself) or more seriously (b) get the crap beat out of me by the locals if the Sox won and I openly cheered for them. Whoever won this first game would have a huge edge, with a 1 game lead and putting the loser in an almost must-win situation for the next 2 games. And we had Roger Clemens who already had 20 wins and a sub 2 ERA going on Saturday. This game featured Dave Stieb, who was an ace level pitcher himself and would end up 5th in the Cy Young race against Mike Boddicker. We had traded for Boddicker at the 1988 trade deadline, and he certainly helped us get into the playoffs that year, although it cost us a promising young outfielder named Brady Anderson, and some Schilling guy as a throw-in to make the trade happen. He had been acquired to give us a strong 1-2 punch at the top of the rotation, and although he was our #2 starter it was really more due to a lack of quality pitchers on the staff than based on his performance. All eyes were on him in one of his most important starts in his Red Sox career. And this is another reason why baseball is awesome. A player only on the expanded September roster as a pinch runner can turn into a hero and no matter what he did or did not do the rest of his career, still be remembered fondly 20 years later. The Sox won again the next day, and held on to take the division, finally clinching on the last day of the season. But regardless of how it turned out, I believe that moment was the planting of the seed that has turned a lot of Canadians and Blue Jays fans into Red Sox haters. 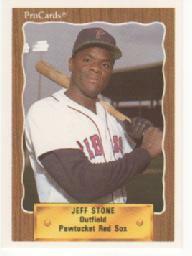 They always complain about not being able to compete with the Yankee and Red Sox payroll, but I always hear a bit more hatred when they sneer at "them Red Sox", and I think it was all due to Jeff Stone's seeing eye ground ball in a late season game in 1990. (*) the reason is that this was pre "every time we have a 3 run lead or less in the 9th we will start our closer no matter what" mentality that is now prevalent in the game. Note that the closer actually came in when we were trailing! Imagine that. On my original site (http://rsnalberta.blogspot.ca/2011/11/baseball-is-awesome-jeff-stone-game.html) someone pointed out that Stone did not hit a grounder through the infield but rather hit a gapper past the outfielders who were playing shallow. I just took a look at the grainy footage I had of that game (originally from VHS converted to DVD), and the commenter was absolutely corrrect. ... cool. I was only nine years old during this series and I became a huge Red Sox fan right around that time, living in Massachusetts. I don't remember the Jeff Stone hit, but what I do recall was Tom Brunansky slamming five home runs during that series, including three in the middle game, as the Sox swept Toronto. I enjoyed reading your detailed, stream-of-consciousness recollection.